I’d rather see low-budget movies (just watched The Town that Dreaded Sundown for the fourth or fifth time) about hauntings and serial killers than comedy or the commercially popular latest and greatest epic. The really fun part is when it spills over into real life. I love hanging out in cemeteries and going to those places where creepy and bizarre things happened. On my first trip to Los Angeles, back in the 1980s, one of the first places I asked to visit was Cielo Drive, where Sharon Tate and friends were murdered in 1969. On my next venture west, I found the La Bianca murder house. You cannot imagine the disappointment when I trekked to the corner of Alvarado and Maryland in Hollywood only to find the courtyard apartment where William Desmond Taylor was murdered in 1922 was a parking lot. Or, when I went to the apartment house where Marie Prevost died and was unable to go inside. We learn to live with life’s little disappointments. 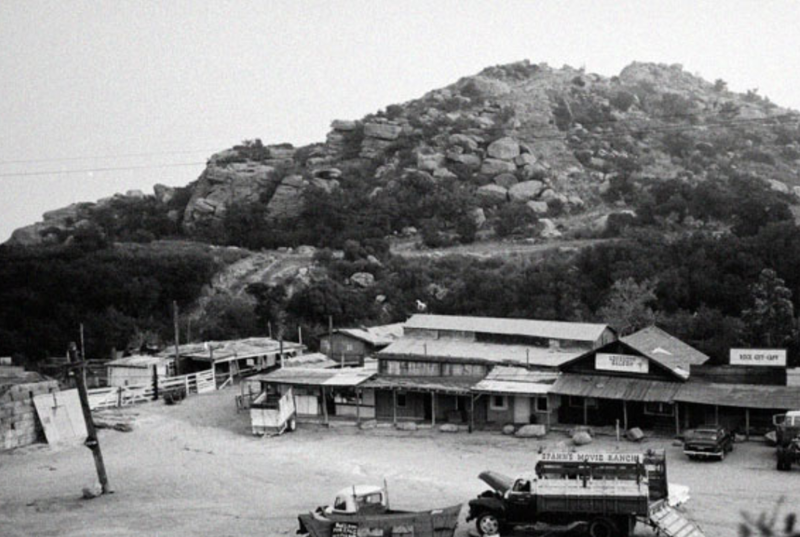 High on my list was the site of Spahn Ranch, which had once been a 500-acre movie ranch for filming Westerns and numerous television programs. You know the story. By the late 1960s, little filming was actually done on the desolate property in the Simi Hills and Santa Susana Mountains above Chatsworth. Its owner, 80-year-old George Spahn, blind and ailing, now used the ranch for horse rentals. It was in 1968 that Charles Manson and his followers, “The Family,” came to live at the ranch. Spahn allowed them to stay rent free as long as they help out with chores. This abandoned, isolated ranch, 20 miles from Los Angeles, became the primary residence of Manson and the Family during the time they committed the Tate-LaBianca murders until Manson’s arrest in 1969 during a raid on the property. The dilapidated buildings of Spahn Ranch burned to the ground in 1970. Mother nature reclaimed the property. It eventually became part of Santa Susana Pass State Historic Park. 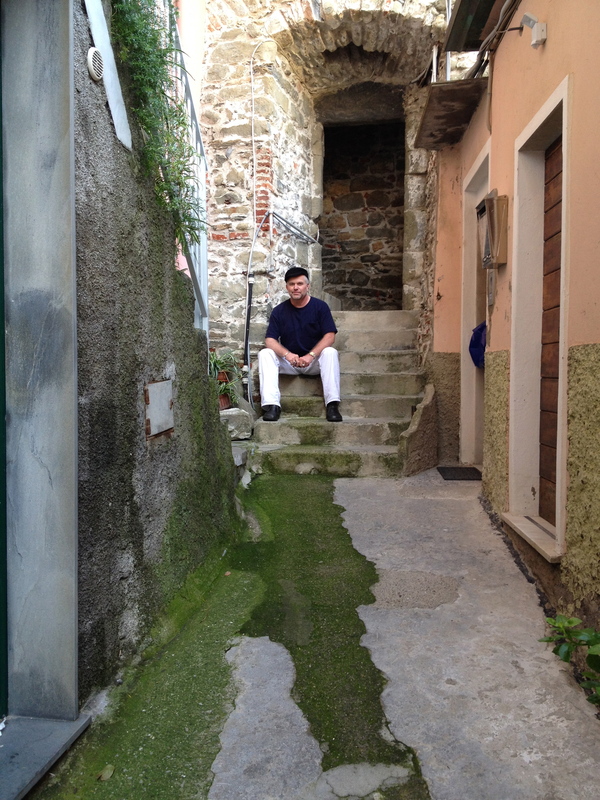 On previous trips to LA, when I was traveling alone, I had been reluctant to explore the area. It was not on any tourist map, and I frankly was not excited about stepping on rattlesnakes or getting lost in the wilderness. In October 2014, Charlie came with me. I was in LA for the second time. The first time was in the spring when I flew out to film an episode of The Ghost Inside My Child. 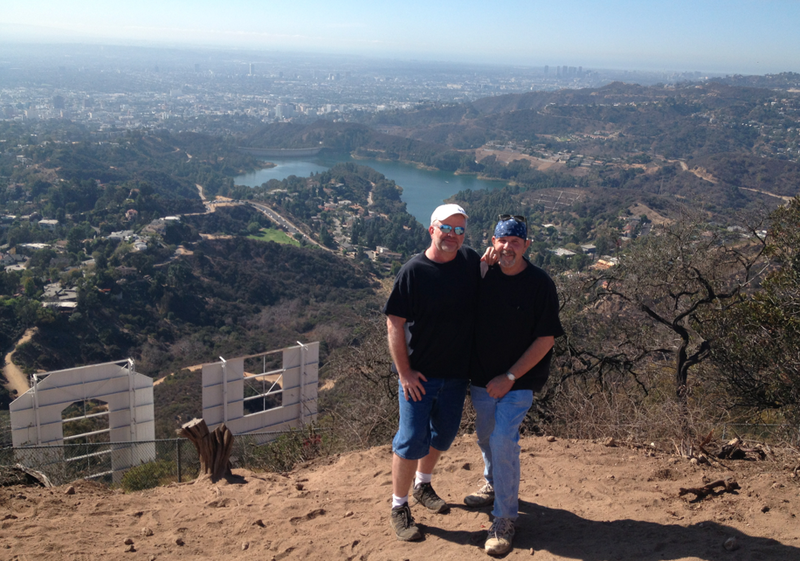 Now, I’ve coaxed Charlie into experiencing some rather wild adventures over our 23 years together, but I don’t think he took seriously my idea of visiting Spahn Ranch on this trip. When we left Hollywood for the coast that morning, just days before Halloween, I had the ranch on my radar for the afternoon. On our way to Malibu, we stopped in Pacific Palisades and located the garage where Thelma Todd was found dead way back in 1935. Later that morning, we hiked in Malibu Canyon and rested at the site where they filmed the exteriors for M*A*S*H. After lunch at Duke’s on the coast in Malibu, we turned inland on Topanga Canyon Blvd. for the Valley. As we neared Chatsworth, the terrain turned mountainous and rocky. 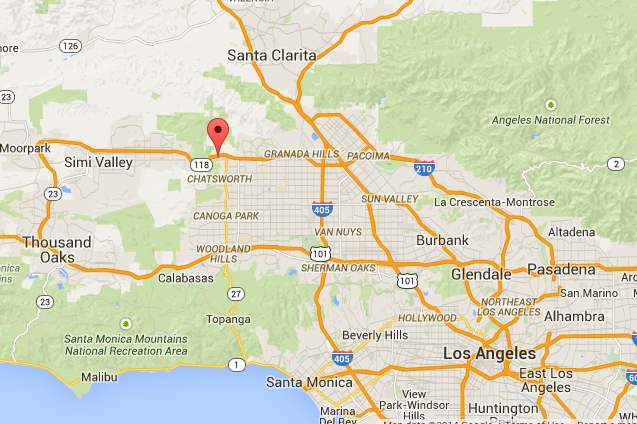 Right before we reached Ronald Reagan Parkway, we turned left onto Santa Susana Pass Road and headed west. When we got to Iverson Road, I knew we were there. I looked to the left. Nothing to indicate it was Spahn Ranch. We turned right onto Iverson. Just ahead, we pulled into the parking lot at Church at Rock Peak. Leaving the car, we set out on foot, back down Iverson toward Santa Susana. 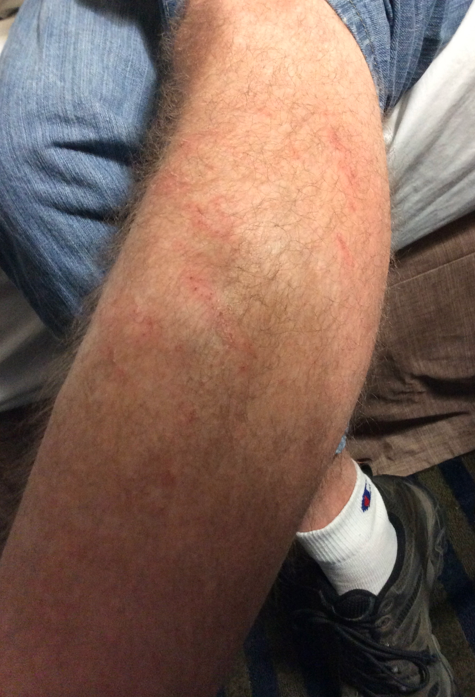 Just passed the guardrail, we skidded down a bank and found ourselves in brush and brambles. As the shadows grew longer in the waning light, I led Charlie down a trail toward the dry creek bed. It had to be here. But where? At one point, the bed was at the bottom of a gully. I had no choice but to go down and explore. Charlie said he’d wait on me. If I found what I was looking for, holler for him. Clinging onto a branch, I lowered myself down toward the creek bed. 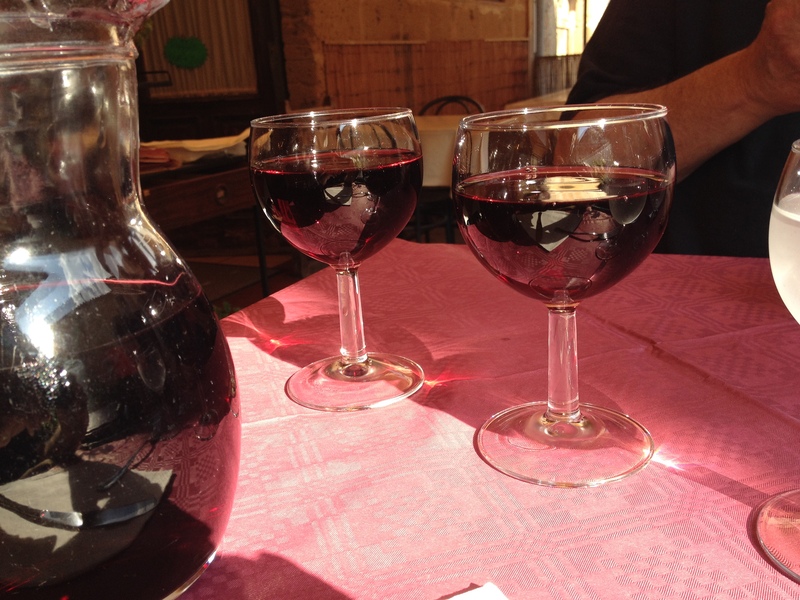 When I let go, the leaves and loose rocks sent my feet out from under me (maybe the wine from Dukes had something to do with my unsteadiness). I tumbled to the bottom, scrapping my shine and breaking the arm of a pair of Revos on the way down. So overgrown with vines and limbs was the area, there was no way to travel along the creek. I carefully pulled myself out of the ravine and met Charlie back on the trail. Daylight was fading, but not my determination. 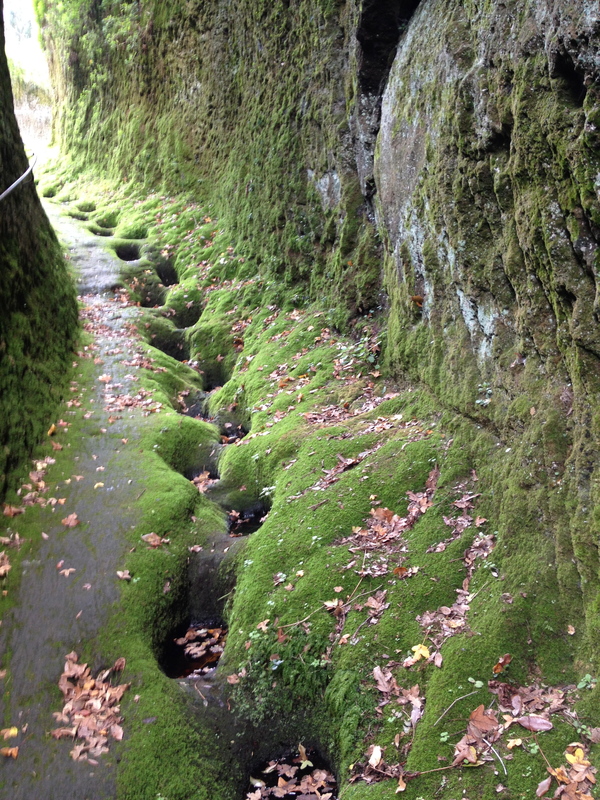 We walked back toward the road and took another trail that led down into the creek bed. Then it came into view, the cave where the Manson family took their now infamous photo. It felt creepy being there, that’s about the best way I can describe it. Although decades had passed since the horrible crimes, a sense of evil still hung in the air like a fog. It was time to go. On the way back to the hotel, we stopped at Iliad Books in North Hollywood — one of my favorite haunts, then had dinner in Studio City at Vitello’s Italian Restaurant. 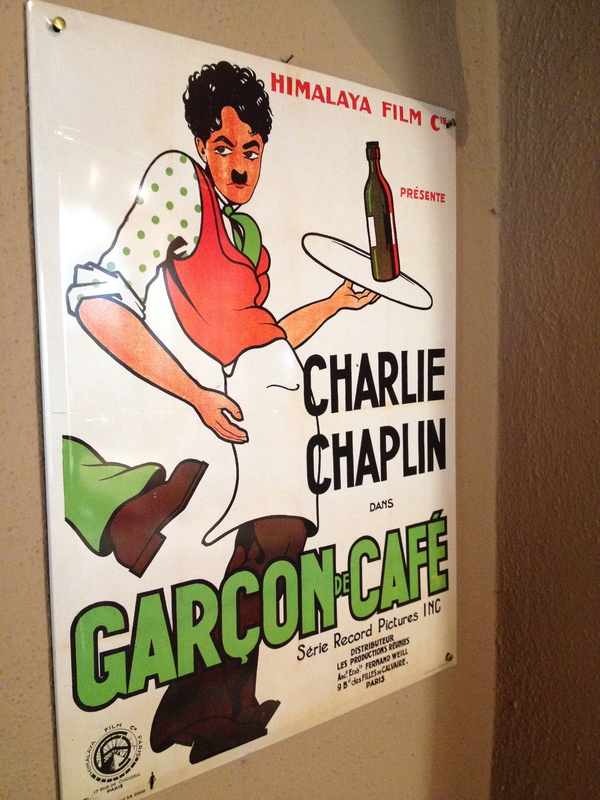 After we turned over the car to the valet, I motioned for Charlie to follow me around the corner from the entrance to the restaurant. “No, what happened here,” he asked reluctantly. 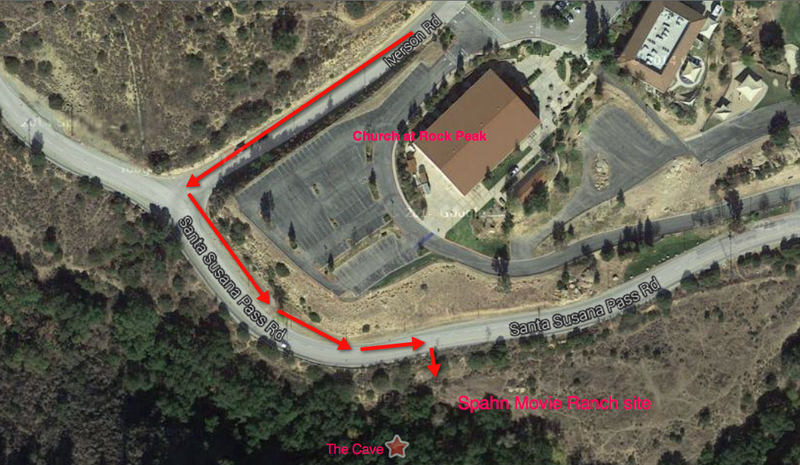 In the event that you have an afternoon to spare and want to make your own visit to the site of Spahn Movie Ranch, follow my directions. Type 22601 Santa Susana Pass Road into your GPS. That will get you close to the ranch. Be careful if you park alongside the road. Better yet, park discretely in the church parking lot (Church at Rock Peak). Back on Santa Susana Pass Road, walk to the end of the white guardrail. Leave the road and follow the trail into the brush. You’re there! Now, explore. Be careful. Watch for rattlesnakes. 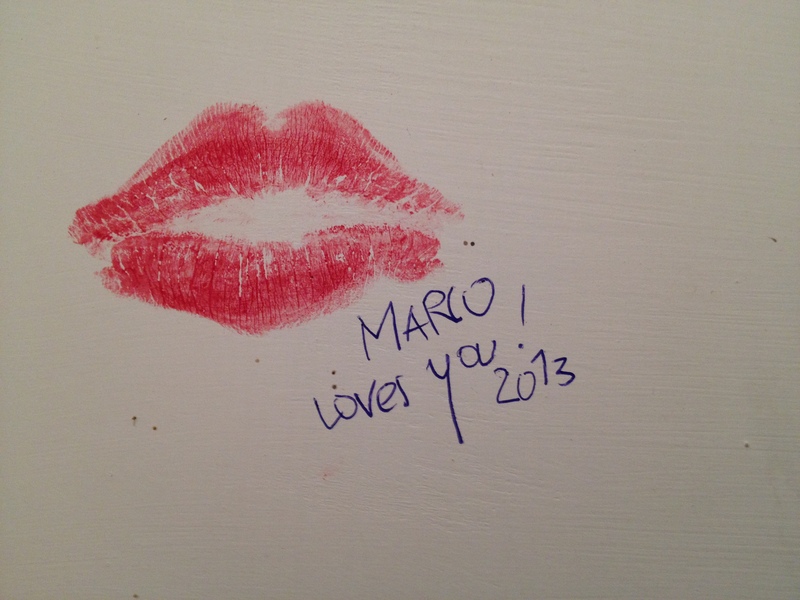 After I fly home from Los Angeles, you know I am always saying that I leave part of my spirit behind. It’s true. The same is also true for Italy. For Los Angeles, it’s my search for and exploration of old Hollywood, especially the Hollywood of the early 20th century. 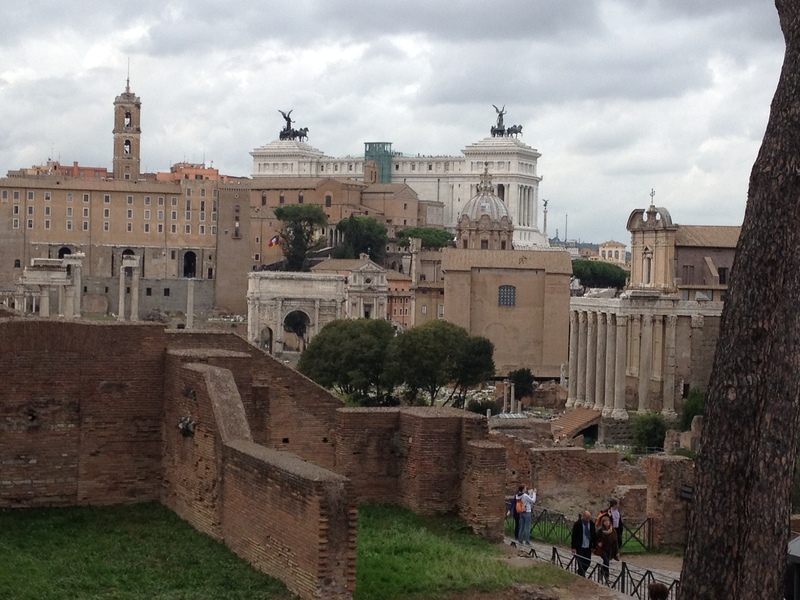 With Italy, it is something different. It speaks to me like no other place on earth, at least like none of the 20 or so countries I’ve been to. It is the beauty of the country and its people. 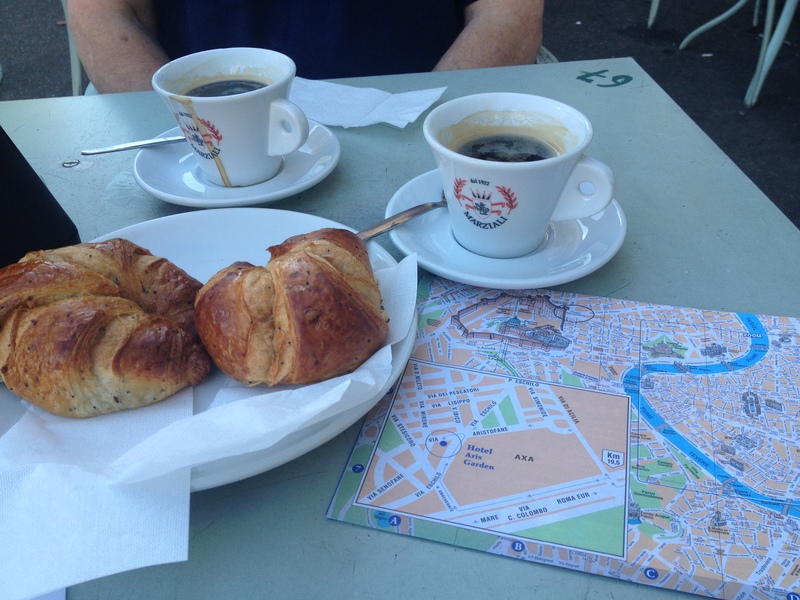 It has to do with the importance the Italians put on something as simple as a meal. It’s the pride they take in their wine, their food, their gelato, their cheese, their architecture, their history, their writers and artists. They know how to live a well-balanced life. 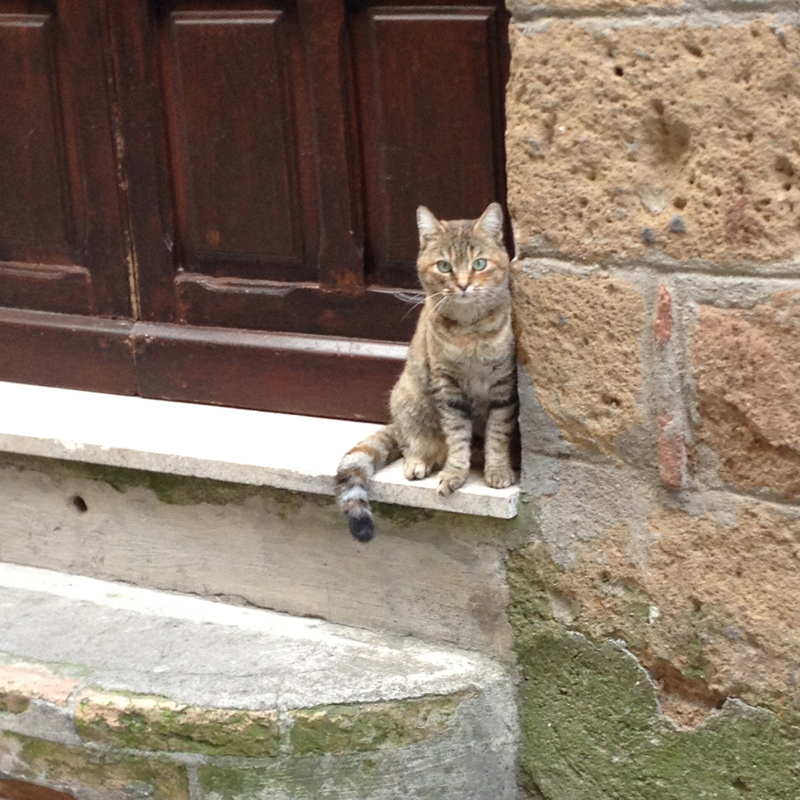 Charlie and I recently spent two weeks in Italy. 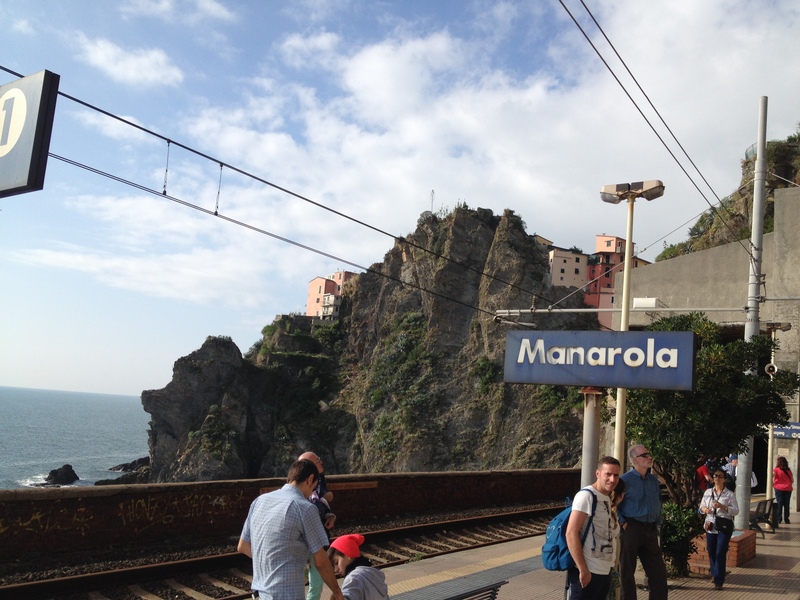 We started in the little village of Manarola in the Cinque Terre. This little town spoke to me like few places have. 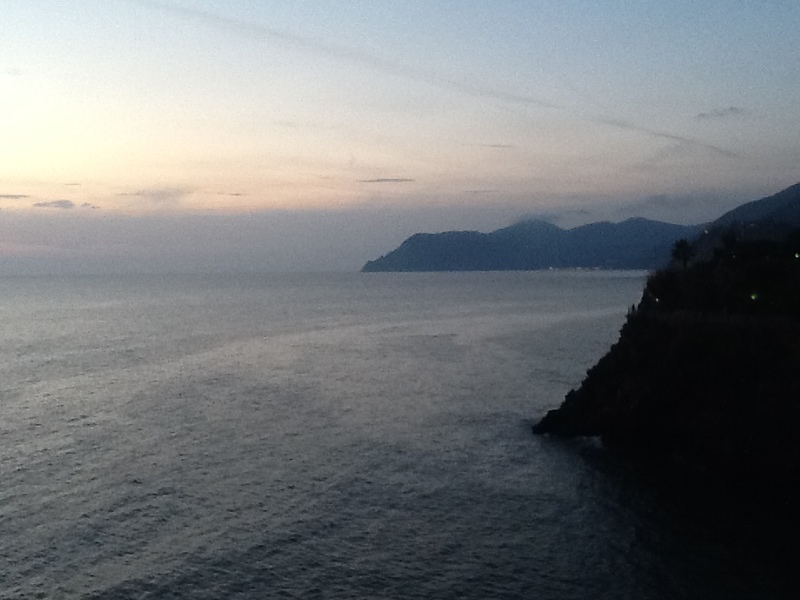 When it came time to travel to La Spezia to pick up the car and head into Tuscany, I had a hard time walking off the terrace of our little apartment. So, my friends, here is a bit of what I experienced. 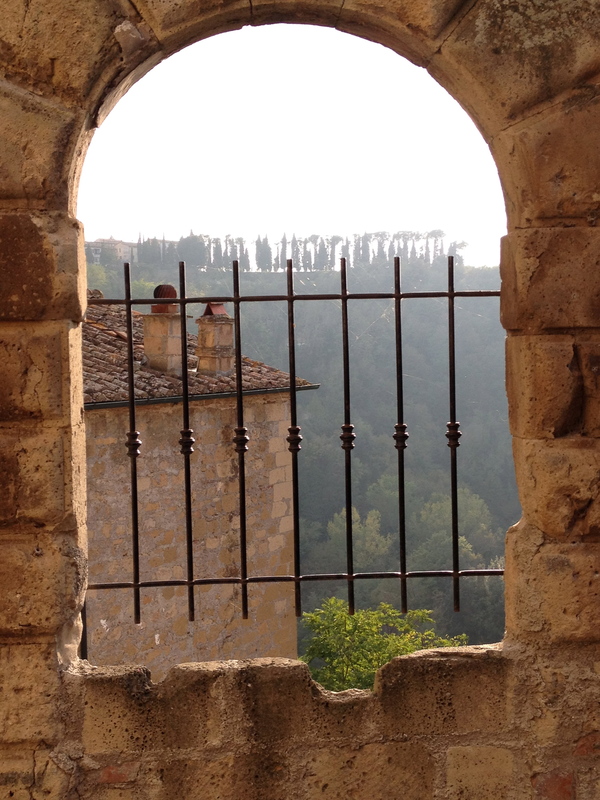 I’m going to shut up and let you see Italy through the eyes of someone whose love for Italy runs deep. 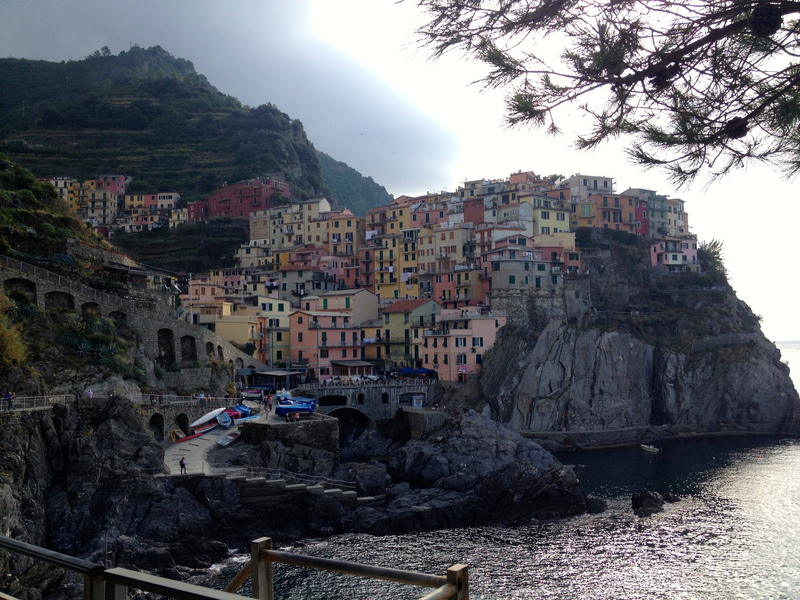 Manarola in late afternoon. 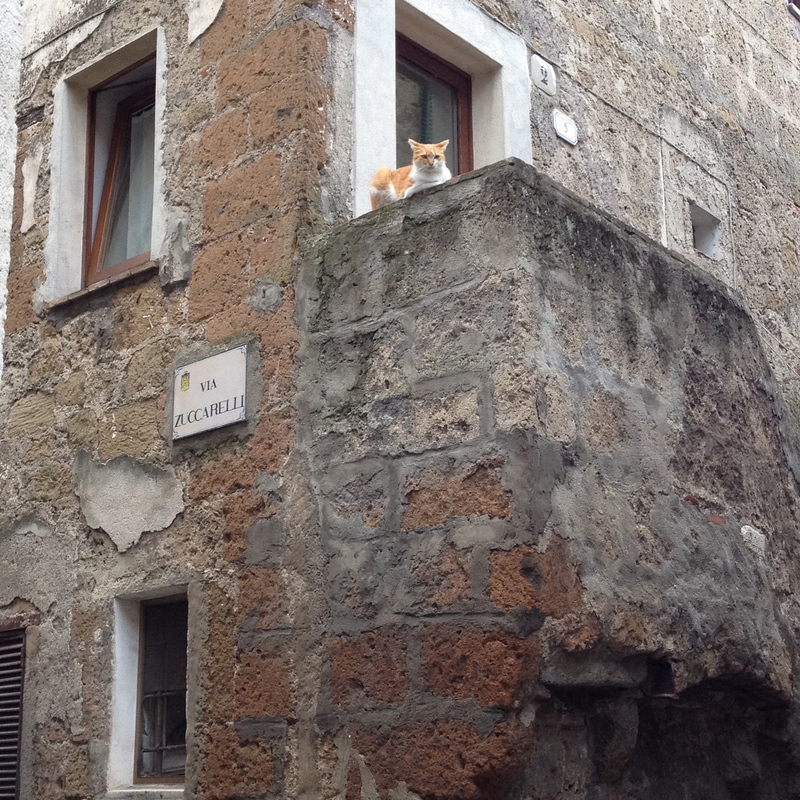 Can you find our apartment? Find the pink building in the middle of the picture. Move to the right and see the other pink building. Our apartment is atop that building. 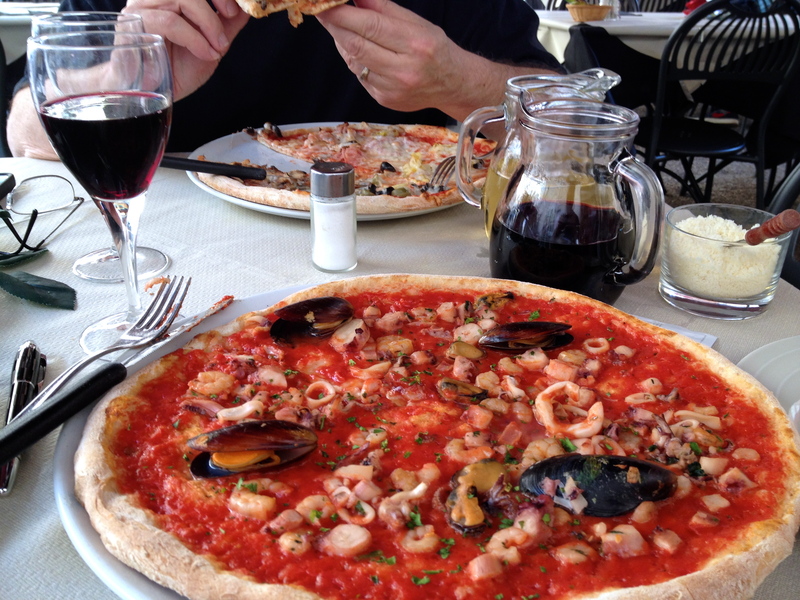 My first meal in Italy. 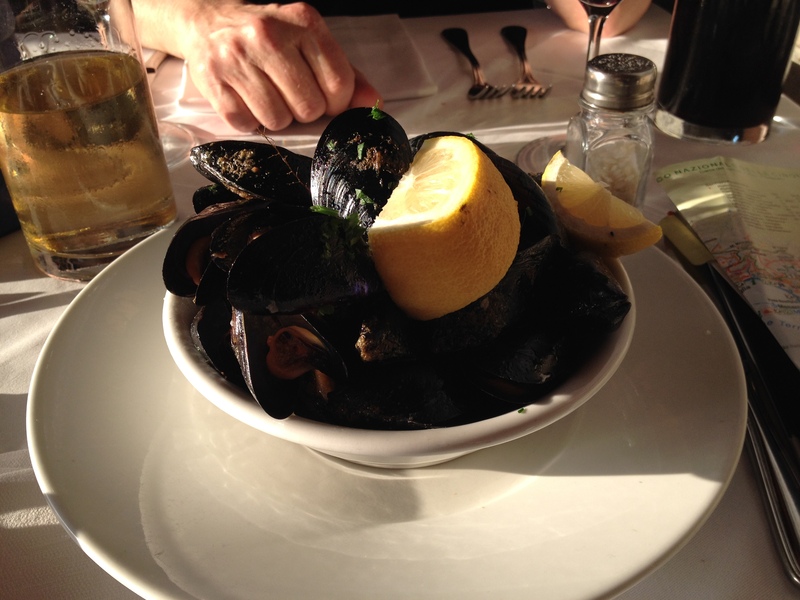 My mouth waters just looking at this plate of mussels. 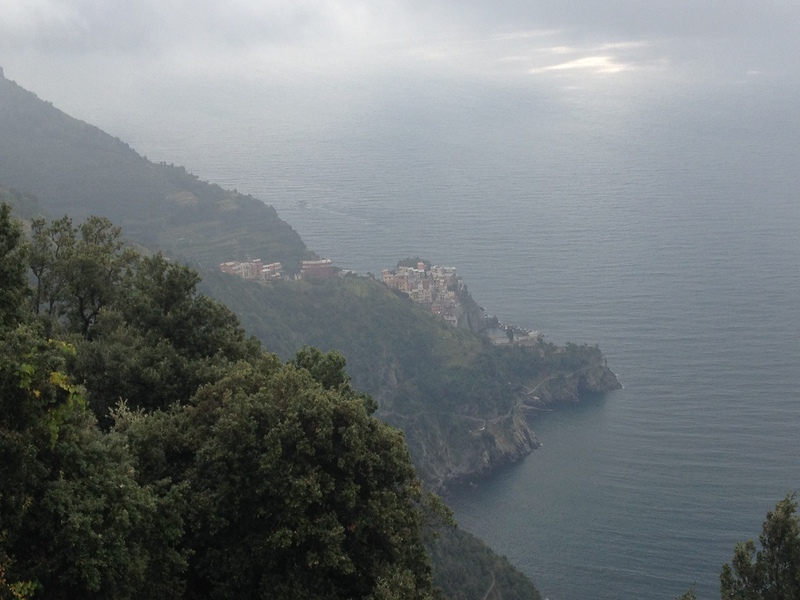 The next morning, we hiked to the next village, Corniglia. 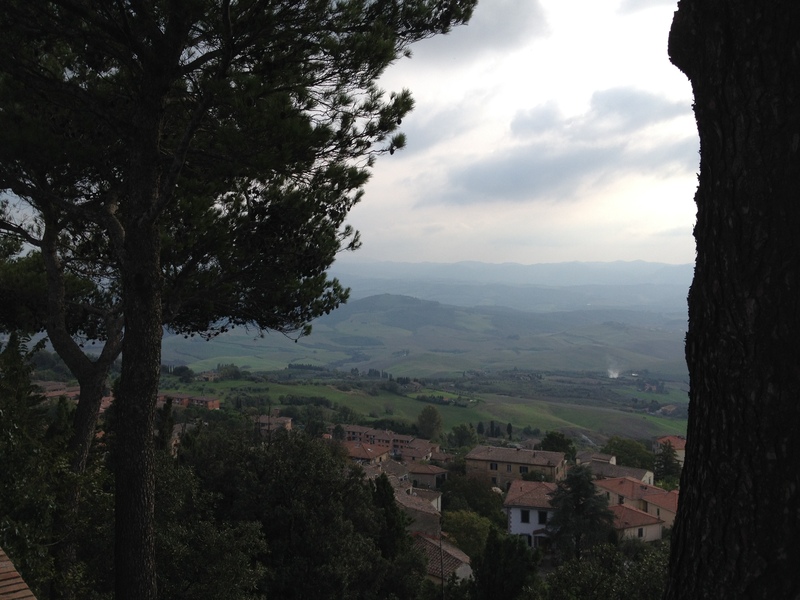 You can see the village in the distance. 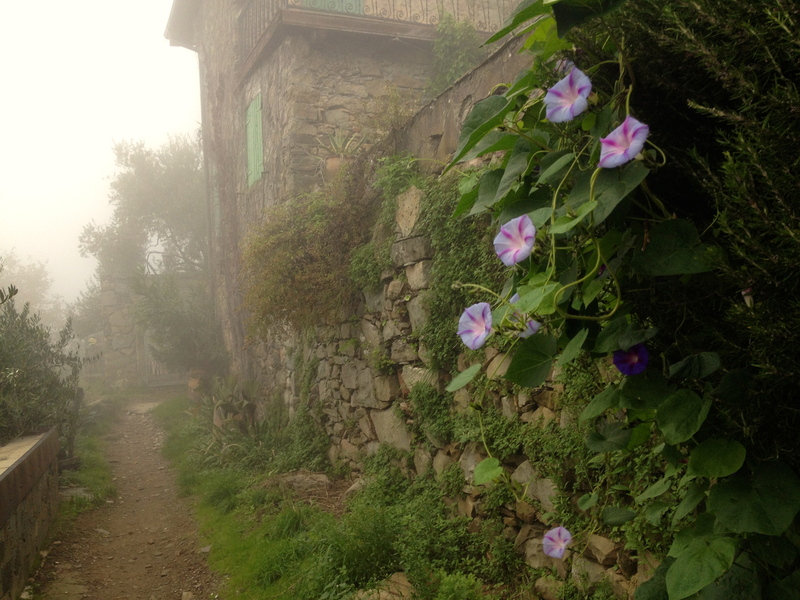 On the hiking trail high above Manarola. 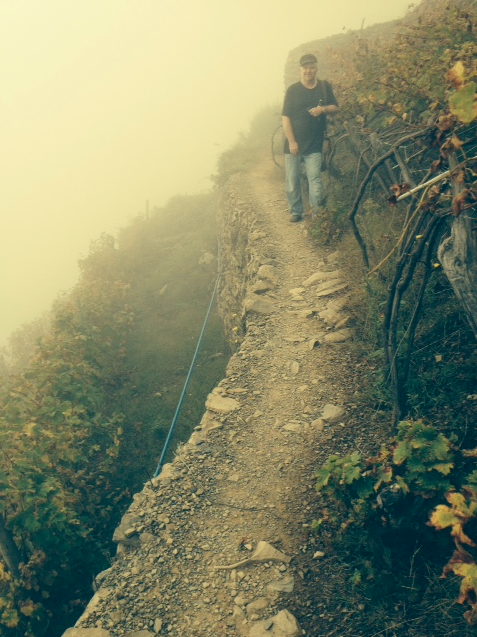 Our path eventually leads us into the clouds. 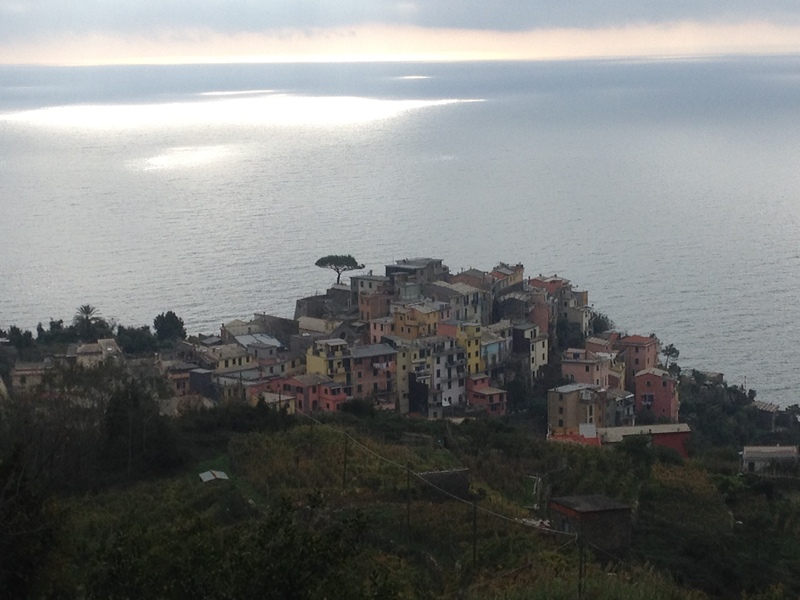 Looking back at Manarola from the hiking trail. Can’t say much about this one. It is my idea of heaven. 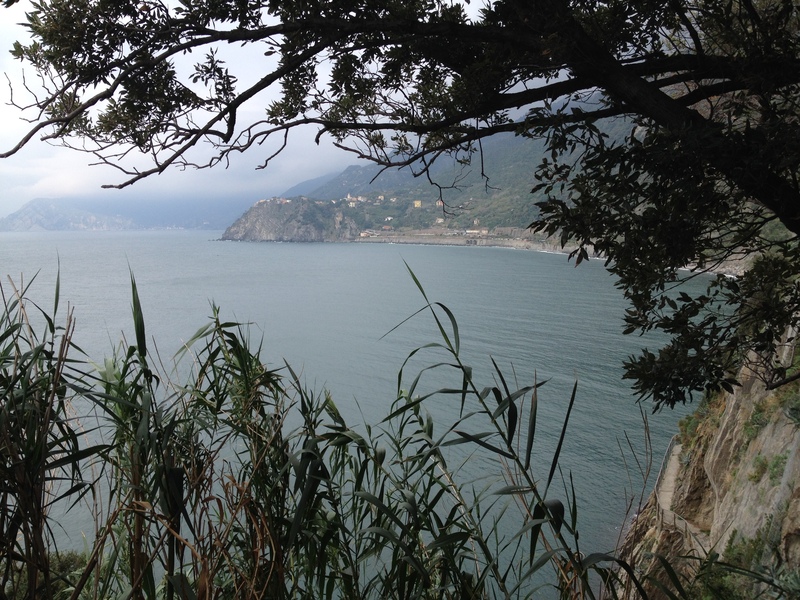 We finally arrive in Corniglia. 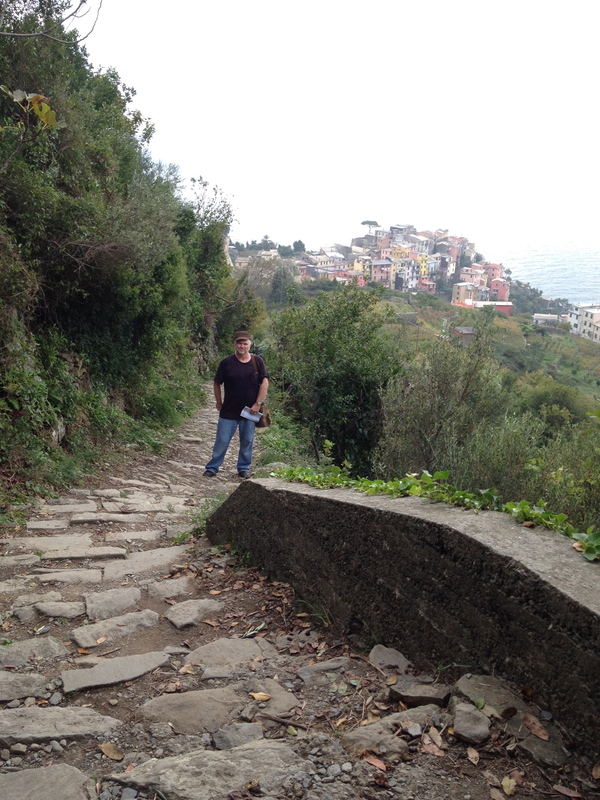 Michael, on the descent into Corniglia. 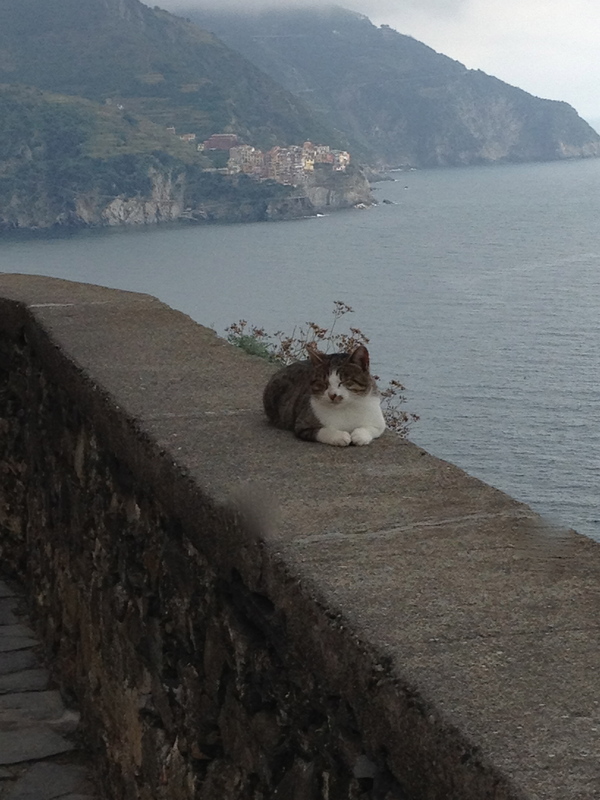 A local basking in the gentle Mediterranean breeze. 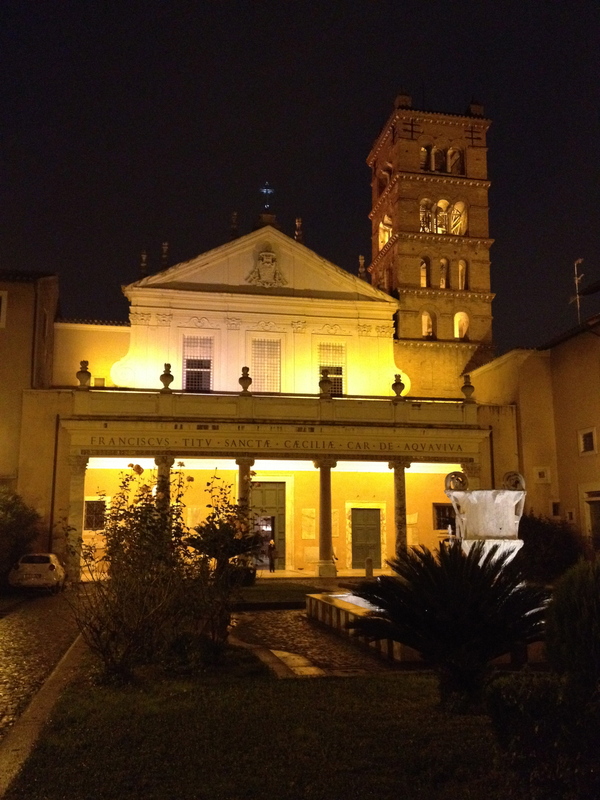 Our travels took us to Lucca, a Tuscan jewel. 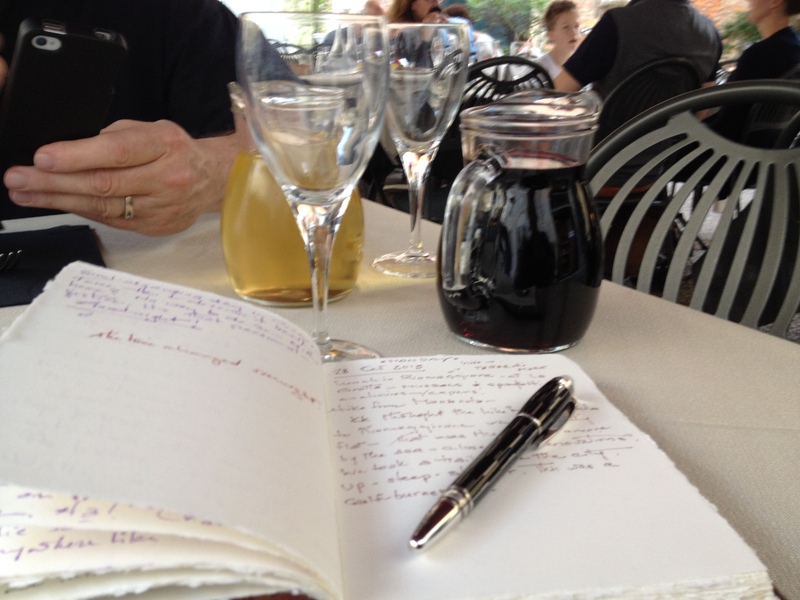 I catch up on my journaling while sipping vino. Mine is the red. Charlie’s will usually be white. 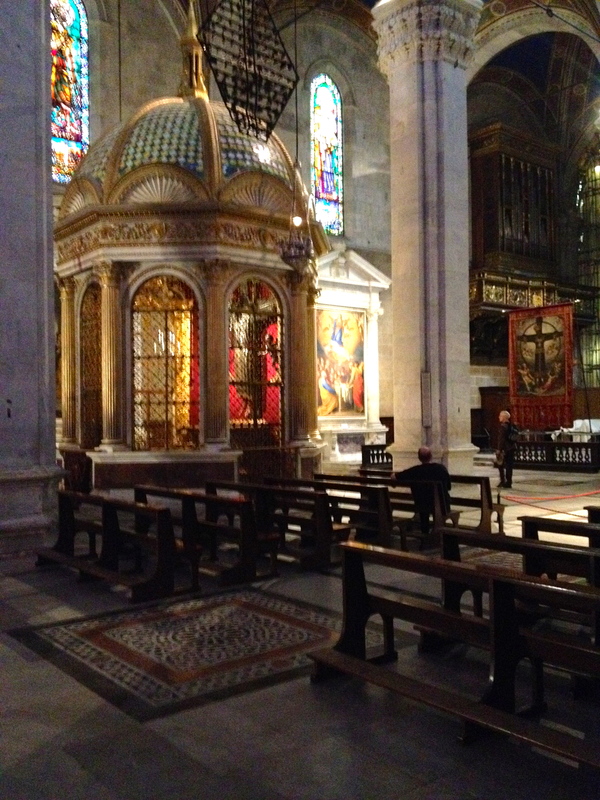 Inside the massive cathedral in Lucca. Easily the best pizza I have ever put in my mouth. 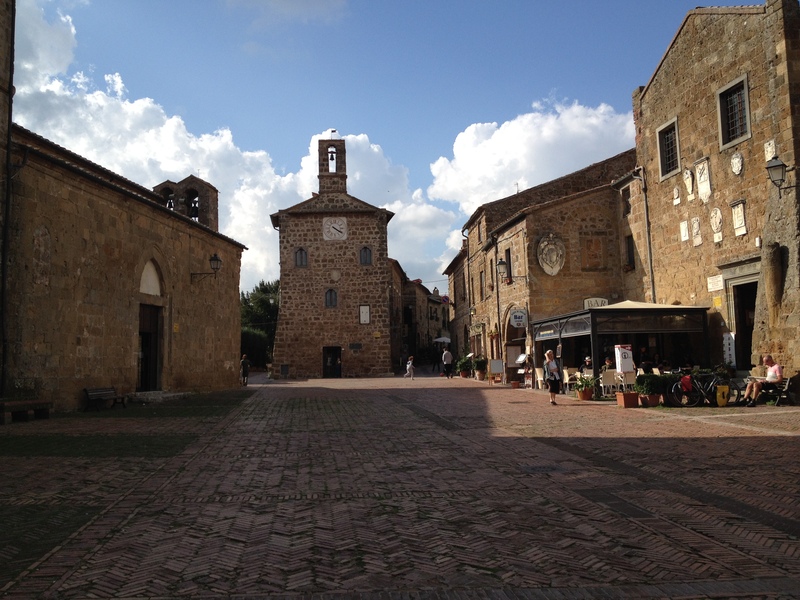 The next day, we drove to Volterra, high in the Tuscan hills. 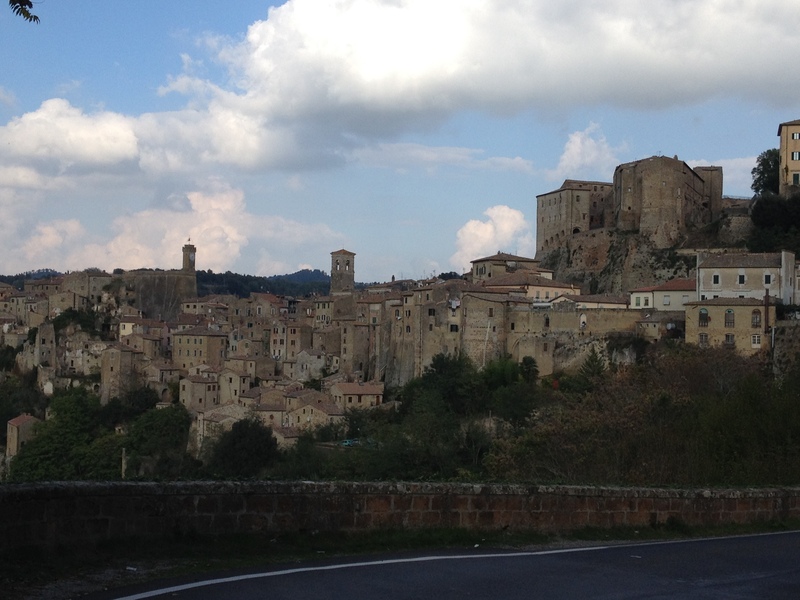 After lunch we drive south to Pitigliano. 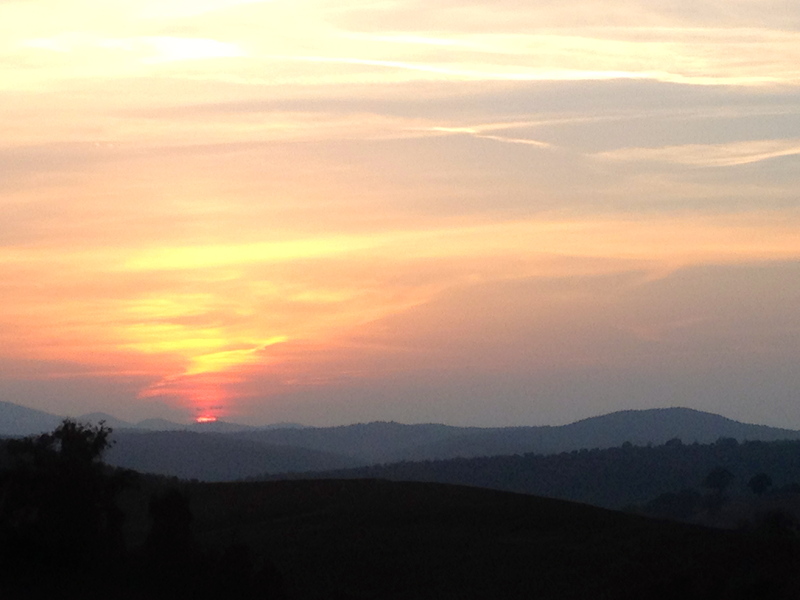 Daylight gave way to a glorious sunset. 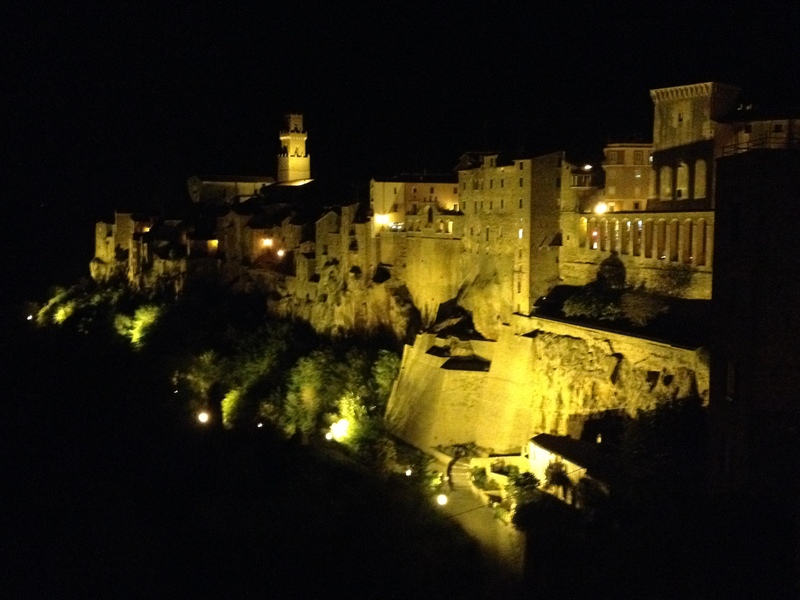 Pitigliano took my breath away. 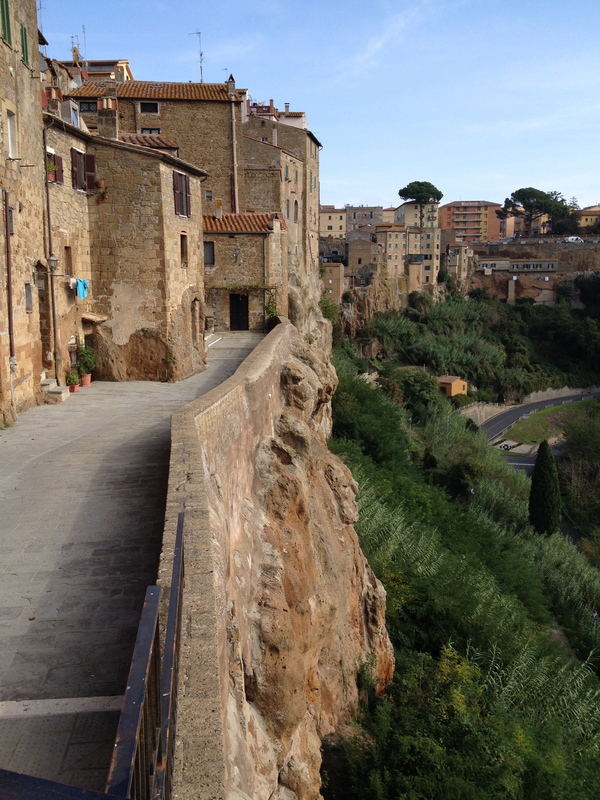 This medieval town seems to have been born out of the rocks. Lush valleys surround. 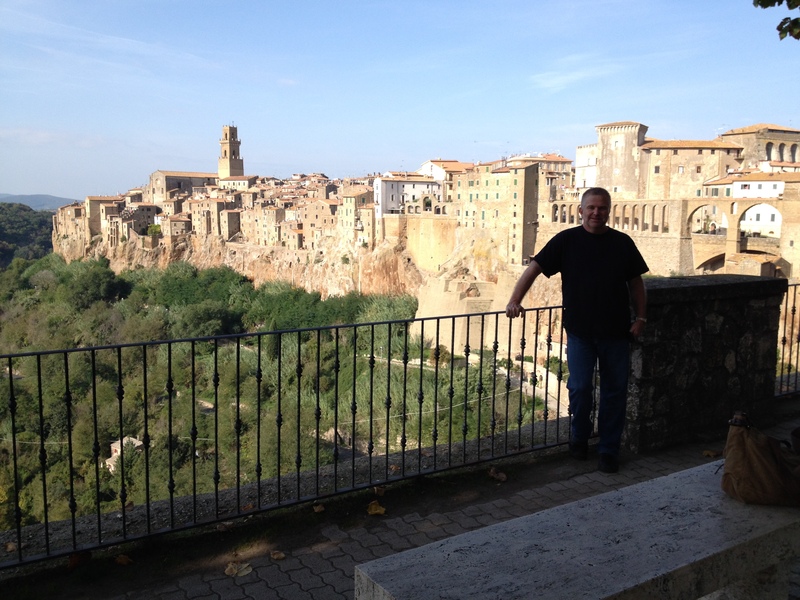 The next six photos give you a view of Pitigliano through my eyes. 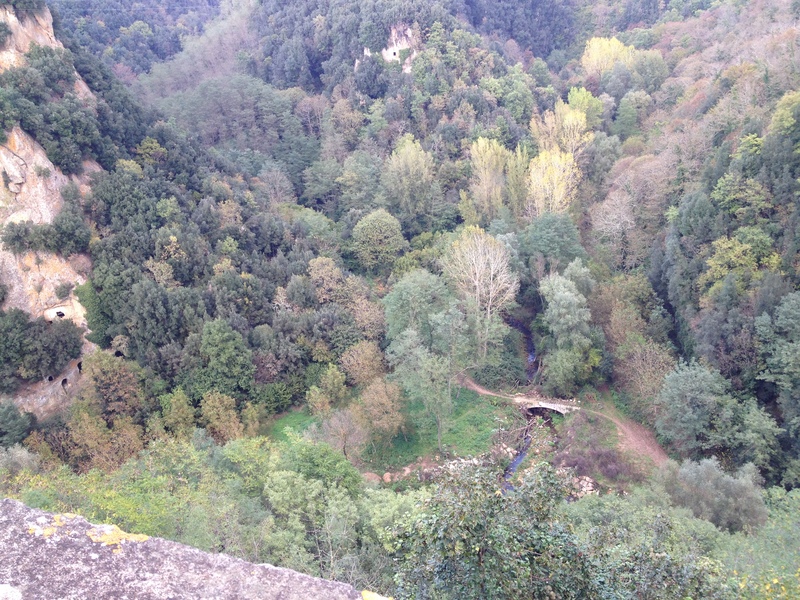 We visited Etruscan tombs below Pitigilano. The steps they carved centuries ago to access the tombs are still there. 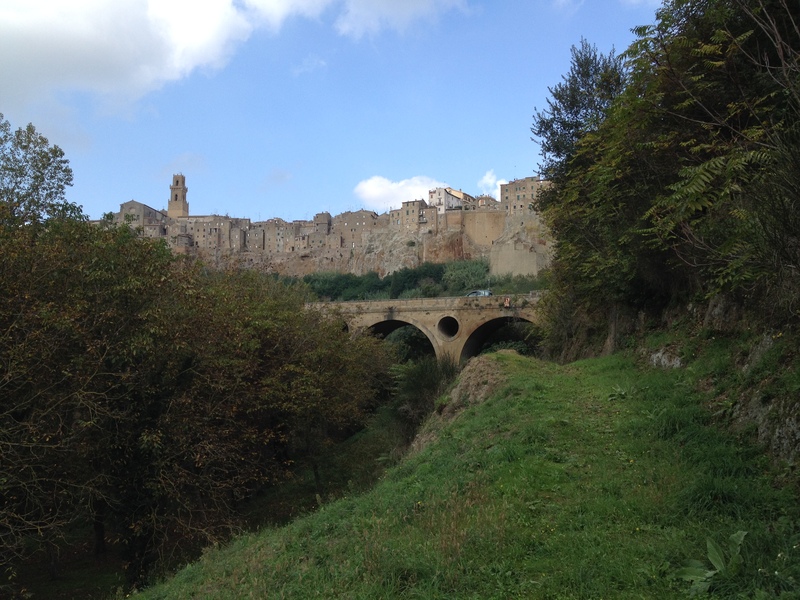 Pitigliano from the Etruscan necropolis. 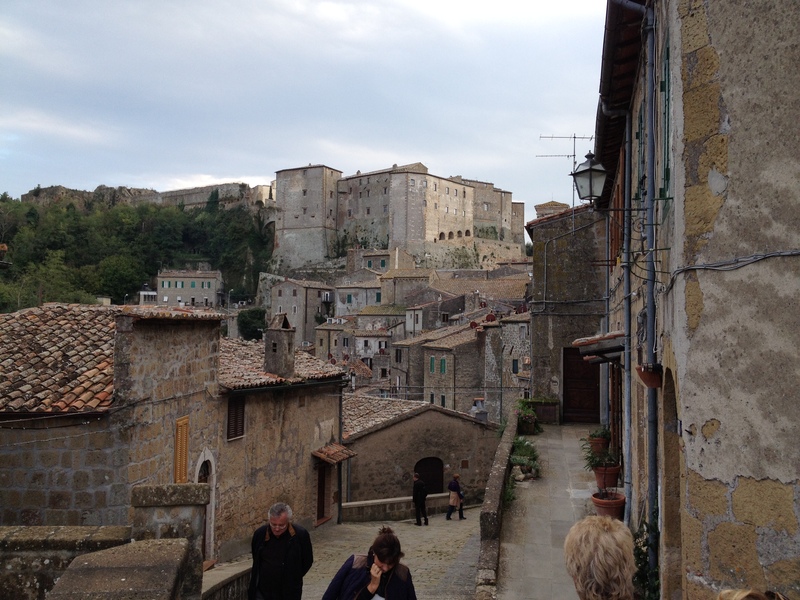 A fall view from Sorano. 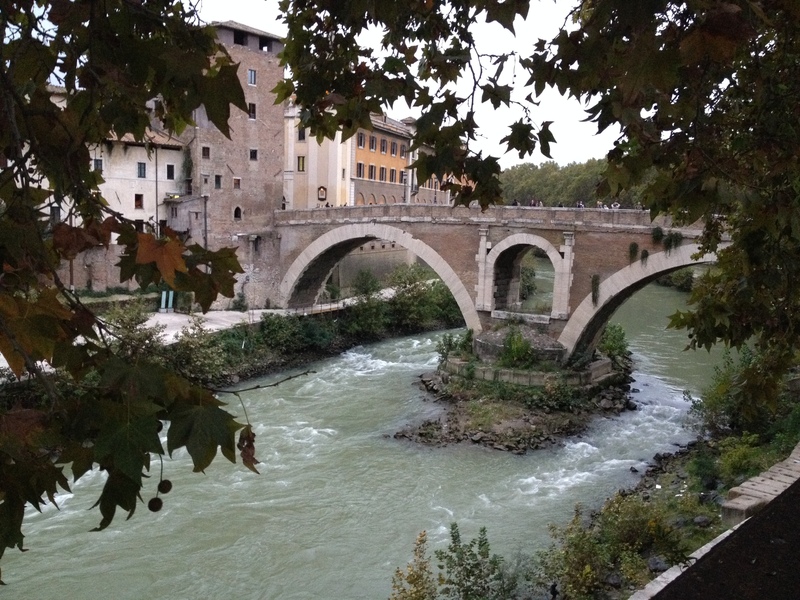 The drive to Rome. 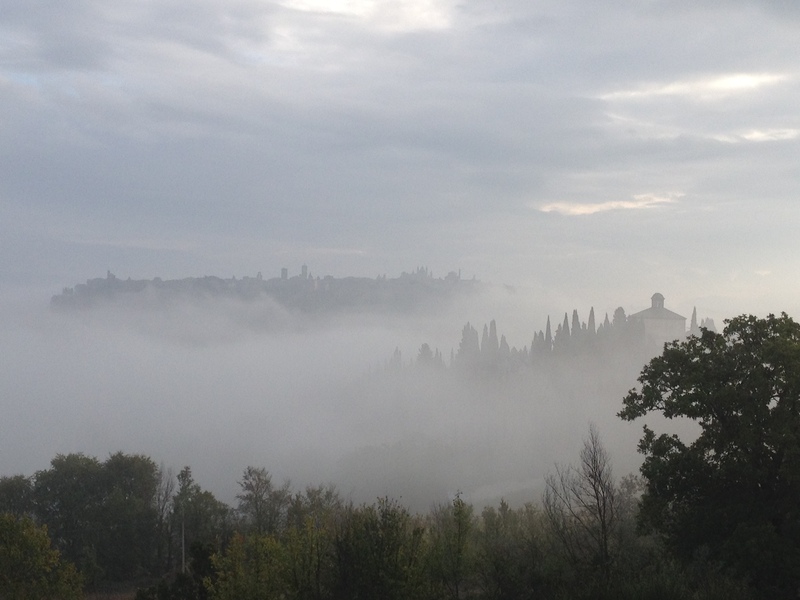 Orvieto is on the horizon. 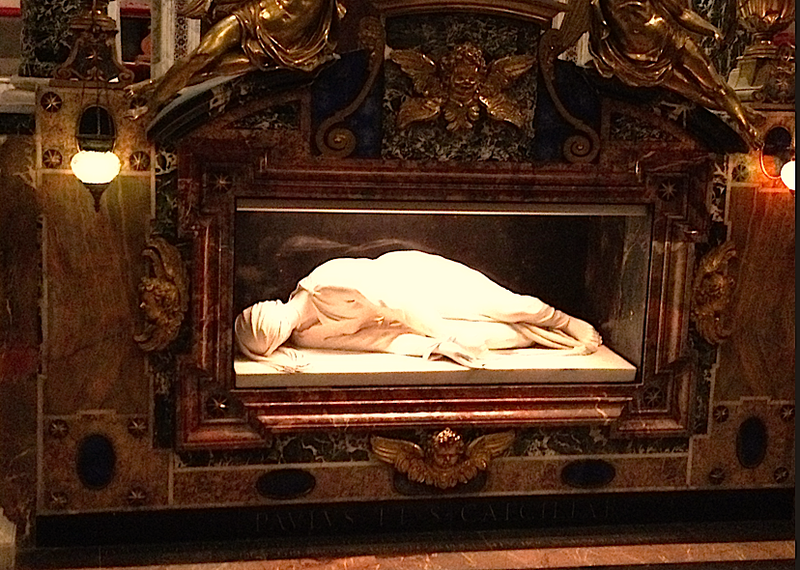 St. Cecilia, the patron saint for musicians. 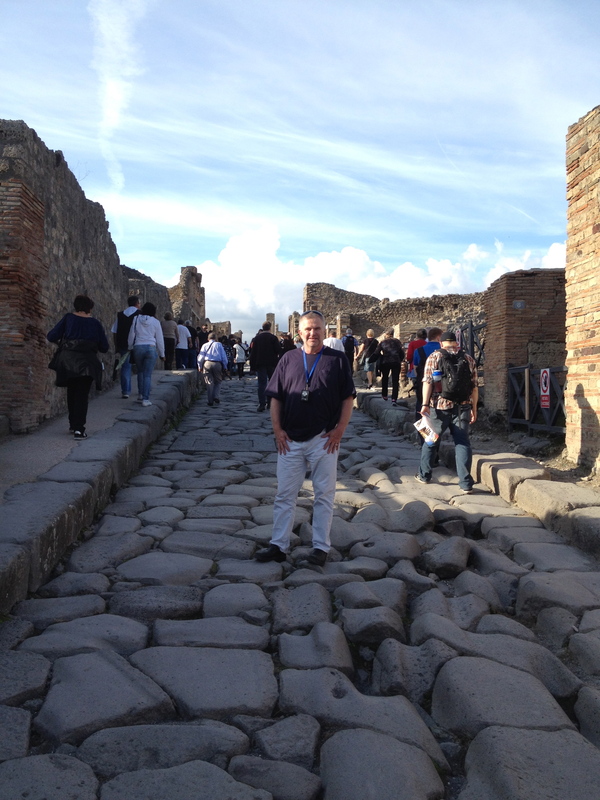 We headed south to Pompeii for the day. One of the most amazing sights I have ever seen. 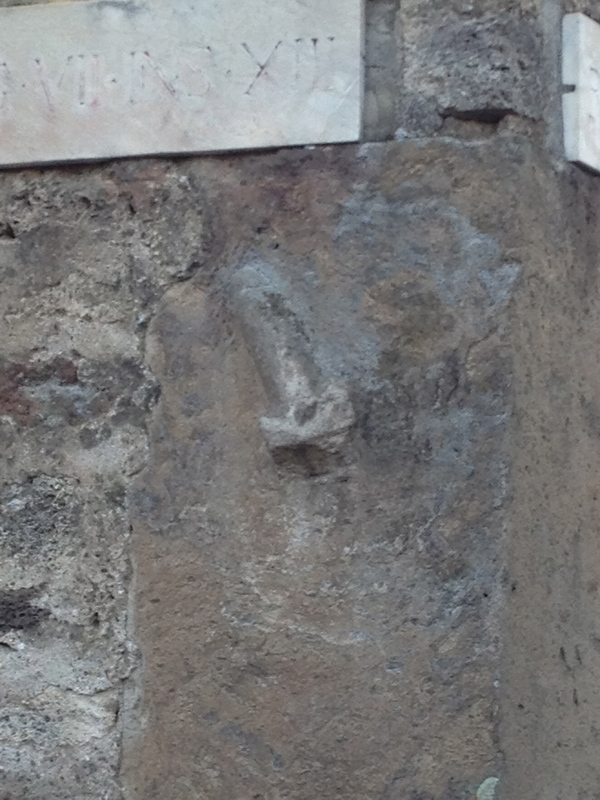 Pompeii had its share of brothels. This carved stone in the wall shows the way to the nearest one. 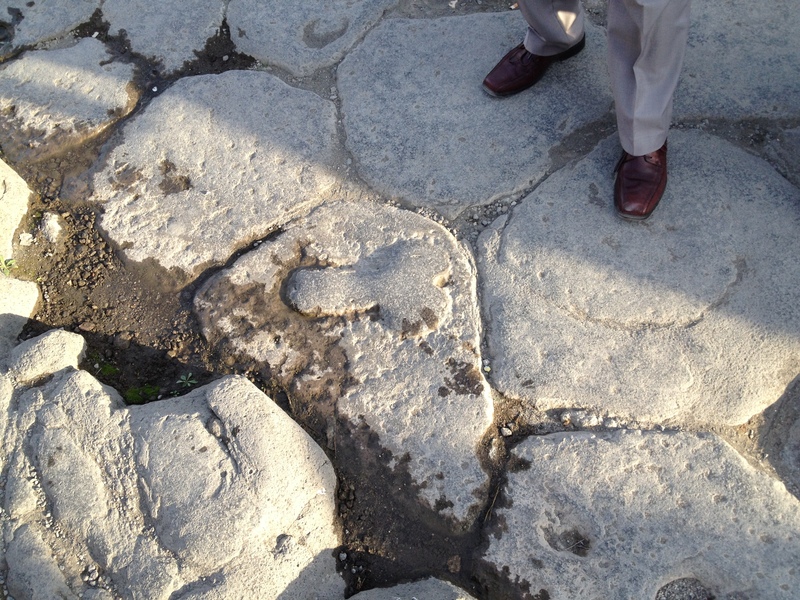 If you got lost and were too bashful to ask for directions, this stone on a major street in Pompeii would help you locate the nearest house of ill repute. 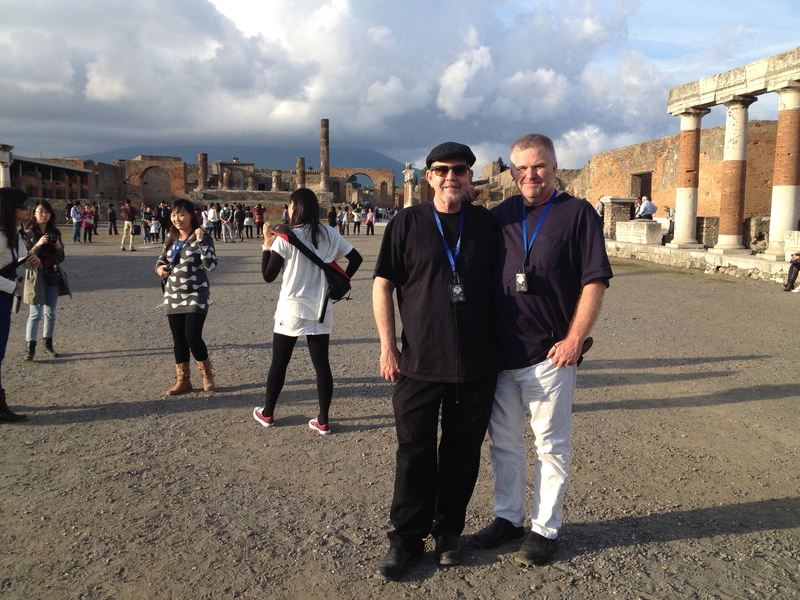 Charlie and Michael in Pompeii. See Mt. Vesuvius in the distance. 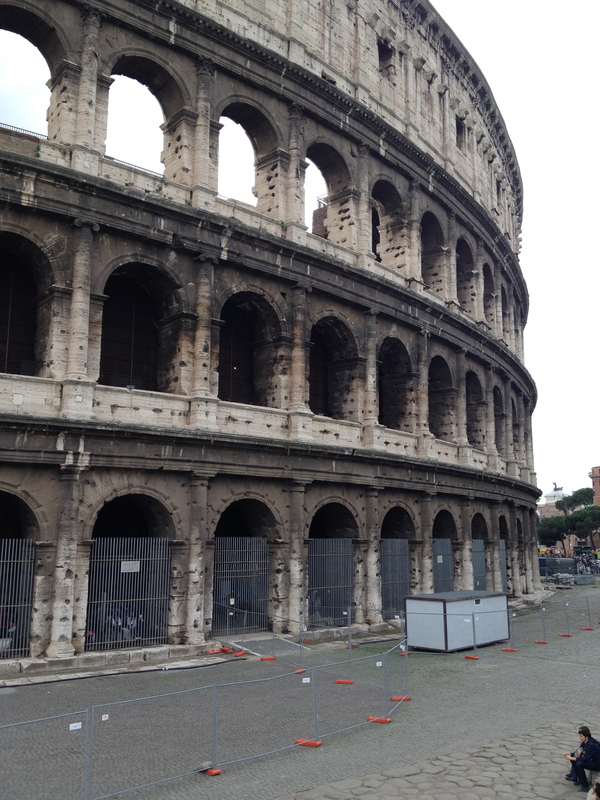 Back in Rome. 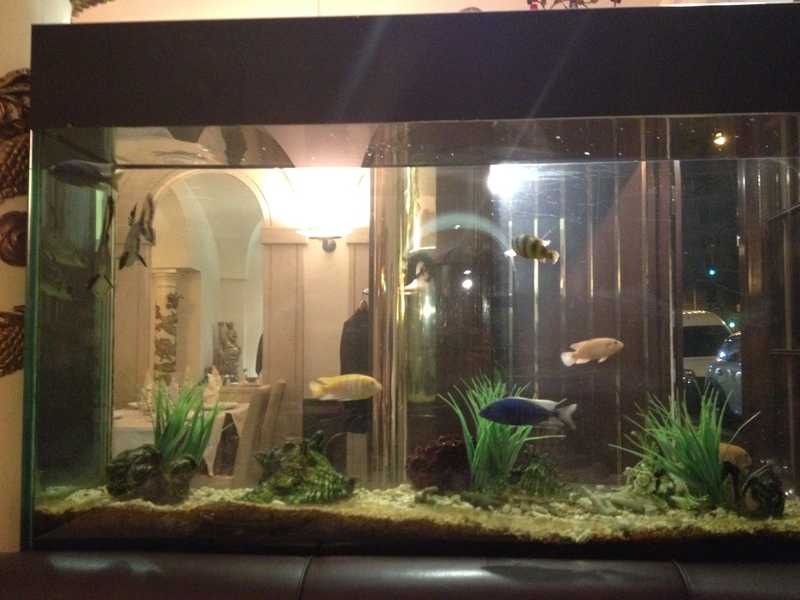 The fish tank at our favorite Chinese restaurant. 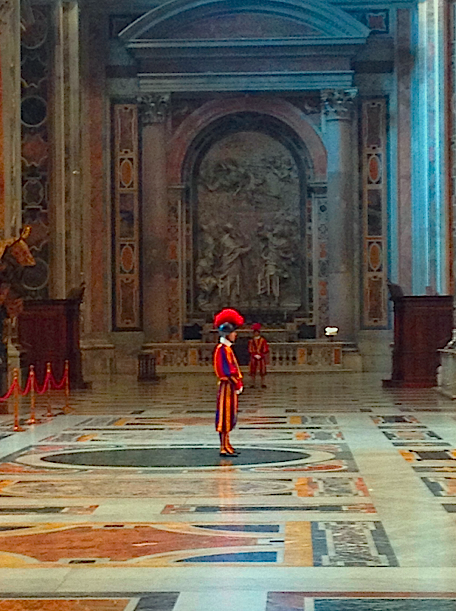 No adventure to Rome is complete without a trip to the Vatican. 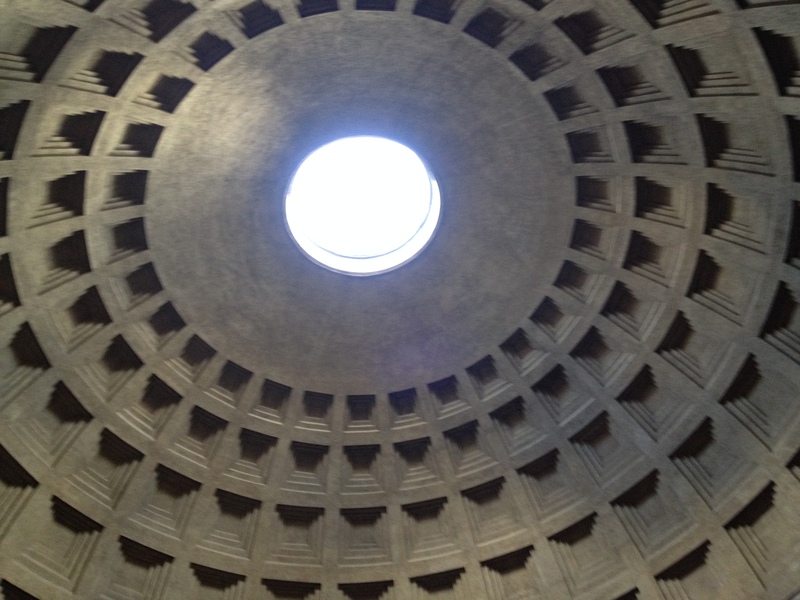 The oculus at the Pantheon. 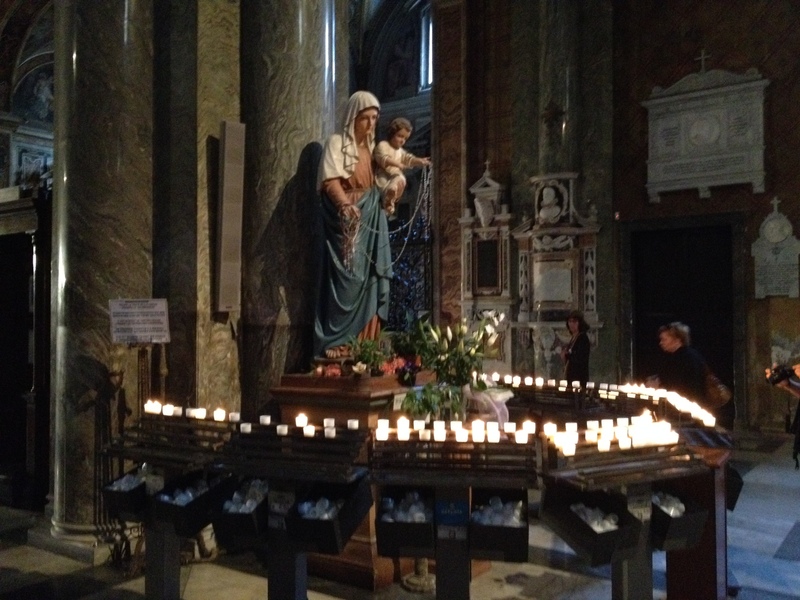 Inside the Basilica di Santa Maria sopra Minerva. 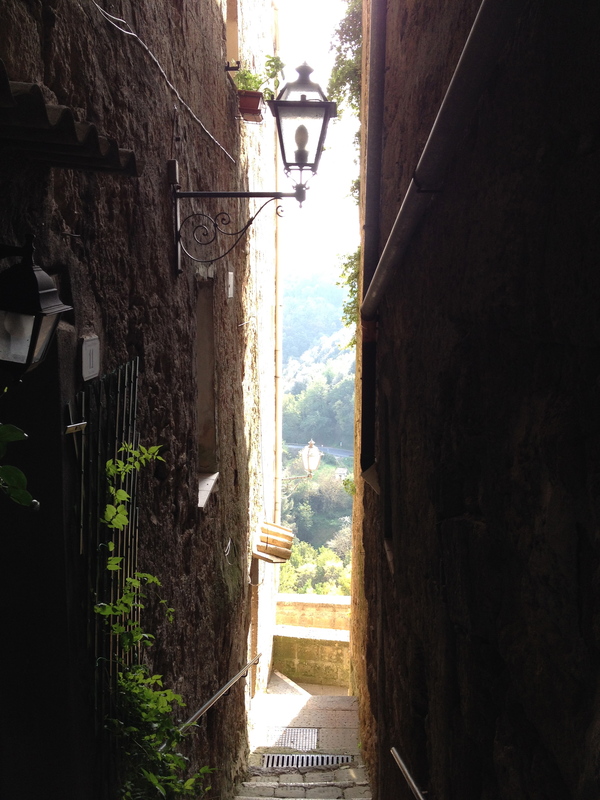 Thanks, friends, for taking a peek into my latest Italian adventure. If I ever drop out of sight, you’ll know I’ve run away. 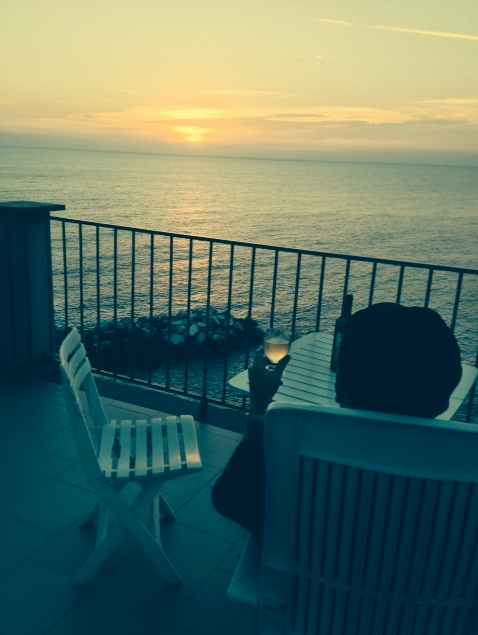 You can find me toasting the sunset on the terrace of my apartment in Manarola.